SIG Sauer P250 vs SIG Sauer P320 – Which Is Best For Carry? SIG Sauer is one of the leading gun manufacturers. They have been setting the bar high with every new entry to the list of guns they produce. However, not all guns they make are equal. And today, we are here to take a close look at the differences between the P250 and the P320. Both of these guns are excellent pieces of weaponry with one crucial difference. The P250 is an older model with a hammer system, while the P320 is an upgrade from the P250 that uses a striker system. That difference doesn’t sound like all too much to someone who doesn’t use guns a lot. But to people who know what they are talking about, it can be crucial. So, who wins this matchup? We have done tests on both of these pieces and made our own decision. When P250 first came out, you could feel the excitement in the air around gun lovers. This innovative gun has hit the ground running immediately. One of the main reasons SIGARMS saw the need to make a gun as innovative as P250 was the fact that concealed carry laws were changing. That has led to the invention of one of the first modular handguns in the world. With the steel frame control unit as the primary module, the P250 allows you to customize it to your need. If you buy this gun, you will have the option of changing the polymer grips, slide sizes, and even the chambering system. You can set up chambers that hold anywhere between six and seventeen rounds. As soon as you pick a P250 up, you can tell that it is not a toy gun. You can use it for recreation, but you can feel that the gun is all about self-defense. 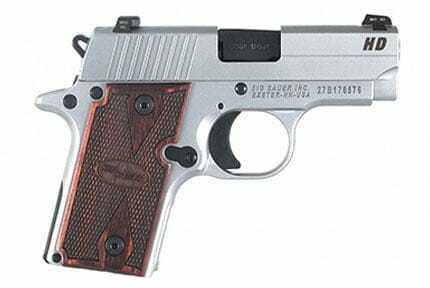 This pistol is a combat gun that is there to save your life if you ever find yourself in danger. In fact, the gun has no manual safeties that would slow you down. When it comes to actually using the modular design, this gun is very user-friendly. You can disassemble it without any tools, and you can even change the caliber of the weapon in minutes. So, if you are in a situation, however rare it may be, when you are out of a specific type of ammo, you can swap out for a different caliber. You can actually switch from .357 to .40 in a minute. For starters, we have to say; we didn’t do all that well with the beginning rounds. We didn’t shoot a gun that uses a hammer, double-action only system in ages. And the P250’s trigger has to travel quite a bit before firing. But, after a couple of dozen rounds of getting used to the gun, we can say that it is incredible. We managed to group shots in a 2-inch area. And even though we think ourselves to be quite good, we are far from professionals. We have actually seen people drive a nail into a piece of wood from 50 feet with this gun. For accuracy, we will have to give it a solid 4 out of 5. This is a very durable gun that definitely won’t break down on you. Unless you get a Gen 1. Namely, if you have been around for a while, you have probably heard of the issues from the Gen 1 of P250. Thankfully, SIG Sauer is not a company that would let such issues slide. Starting with Gen 2, they did away with all of the issues they had found. We couldn’t get our hands on a Gen 1 for testing, but our 2013 model shot well over 700 rounds without failing. On that fact alone, we have to give it a 5 out of 5 so far. We have to admit; we don’t really like the design of this gun. Sure, it looks tough, durable, and combat-ready. So we can definitely applaud people who love how it looks. We would just prefer if it were a bit less blocky. For that polarizing look, we have to rate the looks with an average 3 out of 5. Casual shooters and pros alike can both appreciate the feel of a gun in their hands. We love the feel P250 gives us. 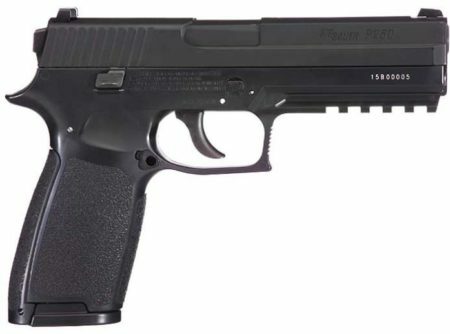 Basically, it is reminiscent of a P225, except that it has a polymer frame. The gun is very comfortable to use, partly thanks to the modular design of it. Namely, if you dislike how the grip feels in your hand, you can swap it out. 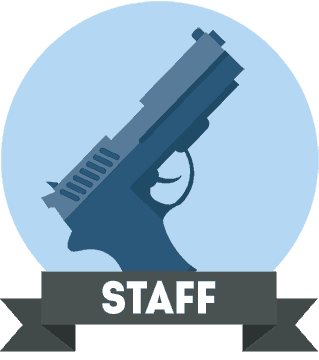 And since several police services use the P250, it is a gun that a younger officer might inherit from a colleague. So, the ability to personalize it really comes in handy. The double action trigger is incredibly smooth, and definitely one of the best double action triggers we had came across. It deserves a 5 out of 5 rating for the feel. 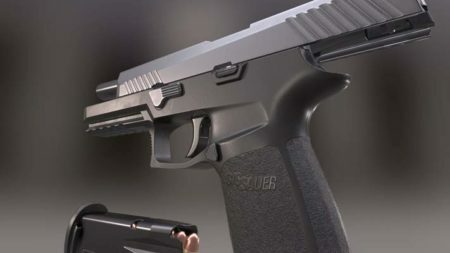 Officially, SIG Sauer is no longer manufacturing the P250. However, you can still get one from gun stores around the States. And the price is definitely one of the best things about this gun. You can buy a P250 for as little as $200 if you take your time to find an inexpensive model. On average, however, it will cost you about $300. And for a SIG Sauer, that price is a steal. A pure 5 out of 5 for this as well. 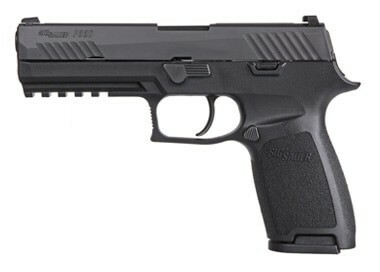 Now, we don’t have to spend a lot of time explaining what type of a gun SIG Sauer P320 is. The reason for that is very simple — it is basically the same gun as P250 with a few very significant differences. It boasts the same modular system that P250 has, and it is as customizable. It can use all of the same calibers, and it even uses the same Sig Caliber X-Change Kit. But the most important difference between these two models lies in the firing system. 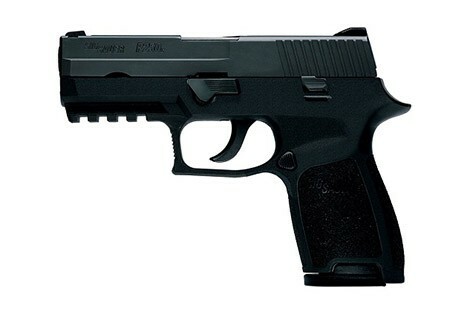 Namely, while the P250 uses a recessed spurless hammer system, the P320 uses a modern striker system. So, in essence, this comparison can quickly turn into a debate regarding firing systems. Striker systems are overall faster to the draw. The reason for that is that they are ready to fire as soon as the round is in the chamber. Shooters with a lot of experience love that feature as they know how to use it. But that feature also comes with a safety issue. Guns with the striker firing system are more likely to fail drop test under certain circumstances. To make sure to minimize that risk, one should opt for lighter triggers that won’t shoot if the gun hits the floor under the right angle. Of course, using tabbed triggers is always the best choice when it comes to safety. Now, let’s take a look at performance differences between the P250 and the P320. 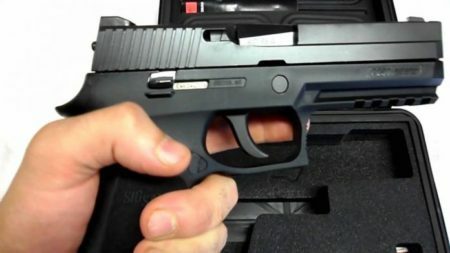 When the P320 came out, SIG claimed it to be the single most accurate striker-fired gun out there. We tested it with .40 S&W ammo, and we have to say — it did not disappoint us. The grouping we got was a bit better than the one we got with Glock 19. We give it a 5 out of 5. The P320 went through our torture test with no significant issues. However, older models without the upgrade did have a potential for a drop test failure. We give it a 4 out of 5. The design differences are very subtle and hard to notice. However, the P320 does have certain builds that look better than the builds P250 offers. For that reason, we give it 4 out of 5. The gun is incredibly comfortable, just like the P250. So it deserves the same perfect rating of 5 out of 5. We got our P320 for $490, which is an excellent price. On average, we have seen this gun going for around 700 dollars. Either way, it is clearly a lot more expensive than the P250. For the price, we give it a 4 out of 5. As always, it is all about personal preferences. For us, the P250 is a great choice because we learned to love the double action system. And we have to admit that the low cost makes it very enticing. However, many believe that the striker system is far too superior to the hammer system to even consider trying to save money on that. Finally, we hope that our guide can help you make your decision.